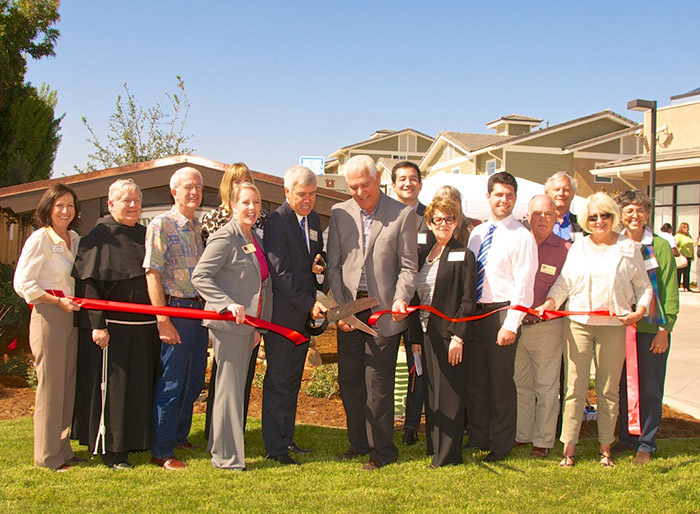 In center, PSHH President/CEO John Fowler (left) and City of Arroyo Grande Mayor Tony Ferrara (right) join with other dignitaries to celebrate the ribbon cutting and grand opening of the Courtland Street Apartments. Arroyo Grande, CA, Oct. 16, 2014 -- Peoples’ Self-Help Housing (PSHH) joined together with local dignitaries, government officials, staff, residents, neighbors, and supporters to cut the ribbon to the all-new Courtland Street Apartments, 150 Courtland Street, which brings 36 new affordable housing units to the community. Also in attendance were PSHH Board Chair Carolyn Johnson, City of Arroyo Grande Mayor Tony Ferrara, County of San Luis Obispo Supervisor Caren Ray, Arroyo Grande/Grover Beach Chamber of Commerce CEO Judith Bean, St. Paul the Apostle Church Pastor Victor Abegg, and representatives from the offices of U.S. Congresswoman Lois Capps, State Senator Bill Monning, State Assemblyman 35th District K.H. “Katcho” Achadjian, and NeighborWorks America representative Alex Sasayama. Sponsored and developed by PSHH, a non-profit organization, the apartment complex is home to households earning 30-60 percent of the Area Median Income. The affordable housing project features four one-bedroom, 18 two-bedroom, and 14 three-bedroom units. Residents can also enjoy a community room with kitchen and meeting space, laundry facilities, youth education center, and playground. Fowler directed development of the Courtland Street Apartments. The development team also included Senior Construction Director Bill Loar, Construction Supervisor Joe Mangiardi, Project Architect Carl Schneider of CSA Architects of Santa Barbara, Engineer Devin Newton of San Luis Obispo, Landscape Architect Rob Fowler, Interior Designer Adele Rosen, Central Coast Playgrounds and Public Artist Jim Jacobson. Financing was provided by Bank of America, California Tax Credit Allocation Committee, City of Arroyo Grande, County of San Luis Obispo HOME Funds, Housing Authority of the City of San Luis Obispo, Merritt Community Capital Corporation and San Luis Obispo County Housing Trust Fund. Founded in 1970, PSHH is an award winning non-profit organization that develops affordable housing and community facilities for low-income households and homeownership opportunities for working families and special needs populations, such as seniors, the disabled, veterans, and the formerly homeless. With over 1,200 homes completed and nearly 1,600 rental units developed and now managed by PSHH, it is the largest affordable housing developer on the Central Coast with offices in Santa Barbara and San Luis Obispo. For more information, visit www.pshhc.org or call (805) 781-3088 or (805) 699-7227.